Salesforce has the potential to make a huge, positive impact on your nonprofit. But in order to get the most out of Salesforce, it’s critical to have the right internal team in place, from before the implementation project even starts until long after the project is complete. The bottom level is anyone in your organization who will be affected by your new Salesforce system–typically your entire staff. It’s important to make sure everyone on your team is aligned around goals and needs before you begin implementation. 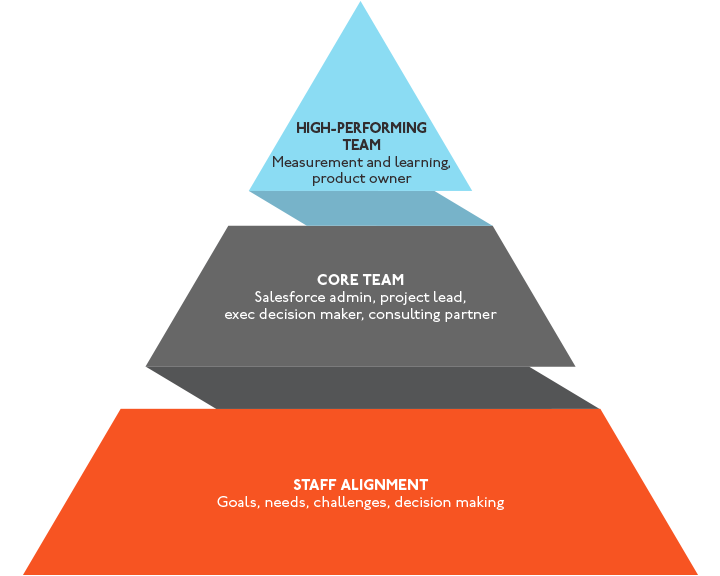 The next level of the pyramid is the core team (Salesforce admin, project lead, decision makers, and consulting partners). Finally, the top level of the pyramid represents a high-performing team. These are the staff who will be responsible for planning–and implementing– what it takes to get your organization to the next level. Let’s take a more detailed look at each of these important levels of the pyramid, and see what it takes to get the right teams in place. How much do you agree on goals and problems to be solved? How much do you agree on the organizational decision making process? Does the organization stick to these decisions (unless the understanding of the problem changes)? Is your organization ready for this amount of change? One good place to start evaluating your readiness is the University of Chicago’s Organizational Readiness Scorecard. The bigger the organization and the more teams involved, the more challenging it is to achieve alignment. Salesforce Administrator. This person is hands-on with maintaining and enhancing Salesforce. They know how the system is built for their organization and how to work with their users to keep them using it effectively. Project lead. This person is empowered to make the hard decisions about what features to build–and what features to leave out. They know how to collaborate with varied stakeholders. They have a good understanding of the organization and of the vision that is driving this project. In smaller organizations, the project lead and Salesforce administrator are often the same person. Executive decision maker. This person champions the project across the organization, removes roadblocks, and helps secure appropriate project staff and budget. Consulting partner (if applicable). 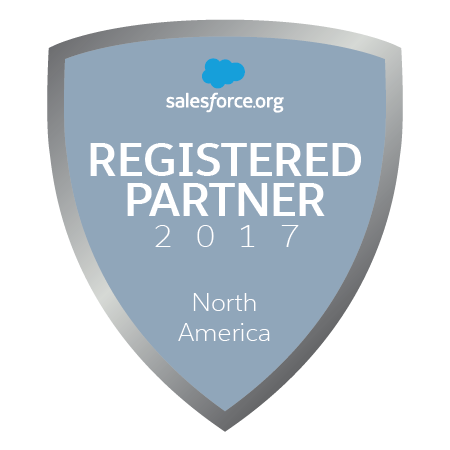 Consulting partners are frequently involved in helping to plan and build new Salesforce systems, as well as follow-on phases. They recognize the strategic value of Salesforce and take a product approach to their work. Their “project lead” is a product owner. This person thinks about where Salesforce provides organization value in both the short and long term. The product owner leads ongoing investment in Salesforce to ensure it grows with the organization’s changing needs. The product owner has a “seat at the table” with senior leaders and is viewed as a peer. They use their system and data to focus on measurement and learning. Continuous learning practices are embedded in each group, but the high-performing team often has an organization-wide role to drive this work and share best practices across the organization. 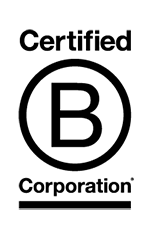 They hire additional Salesforce admins, developers, and business analysts. The more ongoing high-value enhancements that are being made to a Salesforce system, the more important it is to bring some or all of this work in-house. Building the internal team provides more ownership and the agility to react quickly to business needs. When your organization makes a firm decision to invest in the right staff, you’ve set the wheels in motion for a long-lasting and successful relationship with Salesforce–one that has the potential to transform your nonprofit in a myriad of positive ways. Having in-house Salesforce expertise means you get to chart the course of your Salesforce journey. It means you as an organization have the knowledge–and the confidence–to decide how best to manage and extend your Salesforce system to meet your changing needs. At Bigger Boat Consulting, we’ve seen first hand the power of organizations who put the right staff in place. Talk to us about how we can help you get your team set up for success.